It's a great time to sell a boat. Here's how to get it ready. Most of us remember the 2008 financial crisis. People watched their 401(k) accounts evaporate and many lost their job or their home. From that financial meltdown there is a small silver lining, especially for anyone currently selling a powerboat. New boat manufacturing languished for four years after the crisis, creating today’s shortage of quality used boats on the market. Folks thinking about putting a boat up for sale should follow these tips to get their boat in top sales shape. Folks looking to buy a used boat should be able to find quality late-model options after a bit of a drought. When it comes to getting the boat ready to sell, the reality TV marketing playbook is a good model: be visible. Carefully staged photos and drone videos help a boat stand out from the crowd. 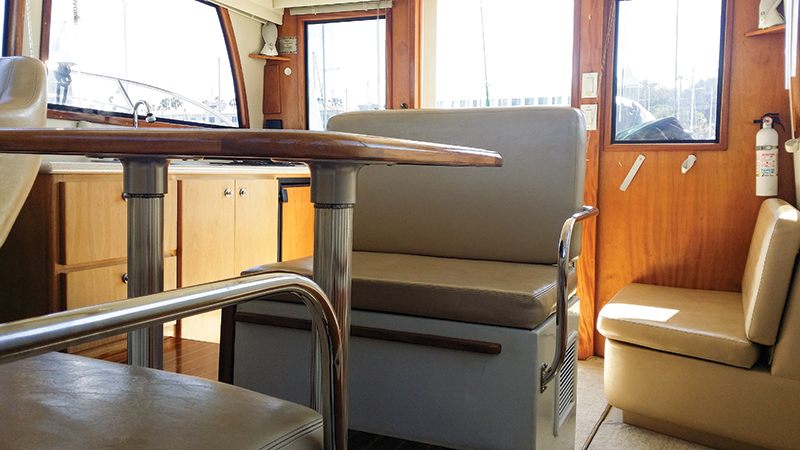 A boat that is free of personal items and clutter — especially in the cabin and cockpit — is key, not only for marketing photographs but also for when brokers show the boat to potential buyers. That means owners should ditch personal photographs, empty clothes from drawers and closets, and scrape off decals that didn’t come with the boat when it left the factory years ago. Brokers encourage boat owners to use their powerboat while it’s for sale, which keeps the engines and systems operating. Swing tells his clients to keep their personal effects in bags that can easily be transferred to a car. Cockpits and cabins should be tidy, especially for photo shoots and buyer showings. Swing says he’s seen advertisements where the bed wasn’t even made. “You have to put in the time and do it right,” he said. Not all improvements are created equally when it comes to a return on investment. Knowing the boat’s market segment and working with a trusted broker, a seller can determine if any improvements are needed to attract buyers. Brokers generally agree that if a seller has a limited budget, he should spend money on combating odors (e.g., holding tanks) and making sure the engine room and bilge are clean. 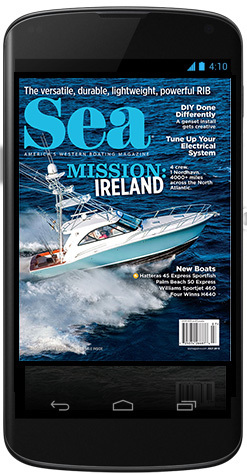 John Murray and his wife, Karen, after selling their Carver 380, searched the West Coast for a used boat, recently purchasing a used 43-foot Selene in Seattle. Murray said odors emanating from compartments are a reflection of how well, or not, a boat is maintained. A seller should consider hiring a surveyor to do a presale inspection on the boat. While a survey isn’t cheap — $18 per foot or more — it can provide valuable insight on what needs to be fixed. A survey can also head off issues by disclosing potential problems early in the sales process. Jeff Keiser, owner of Keiser Marine Survey in the San Francisco Bay Area, said an inspection gives the seller a good starting point for deciding where to spend limited improvement dollars. “You end up with a 30- to 40-page report that goes through every single system and tells you every single problem,” Keiser said. Anyone willing to put in a lot of elbow grease should take aim at the engine room and bilges, to remove any built-up oil, grease or grime. Using off-the-shelf marine products, start at the top of the engine room and work to the bilge. Seek out the hard-to-reach spots where grime has built up and will be spotted by savvy buyers. Don’t forget to turn off the bilges if the boat is in the water. Most brokers recommend hiring a professional to detail the engine room, noting that a thorough cleaning will take an amateur a day or more. Plus, all the water and grime in the bilge has to be sucked out and taken to a disposal site. Instead, use the time to descale rust off parts, apply a little primer and match the paint color. Pull out the generator pans and use a small wire brush to remove rust, then apply some zinc chromate primer and white paint. Abovedecks, the boat needs to be detailed and waxed. 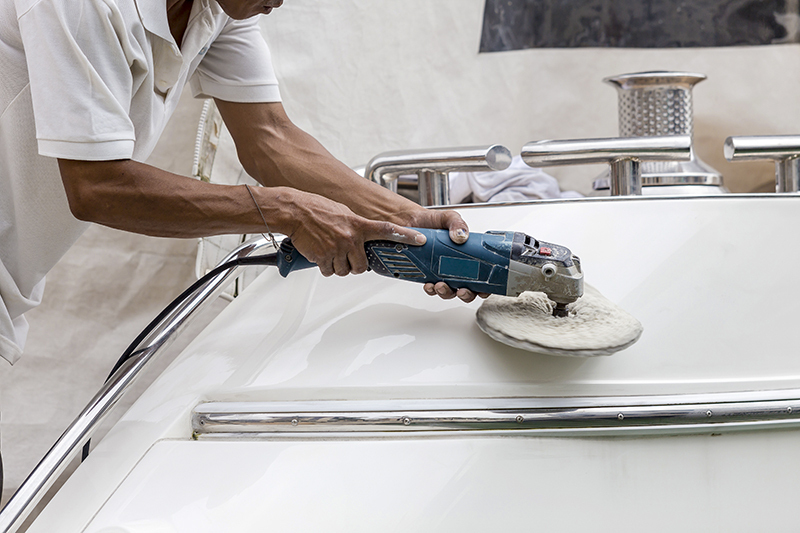 Boat brokers again recommend hiring a professional detailer, but it’s a physical job that most owners can handle. 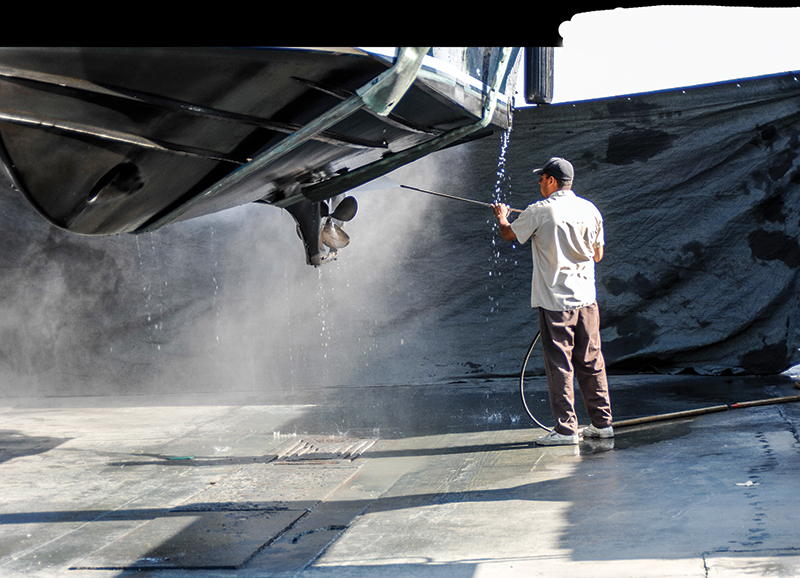 Check with the boat manufacturer to see what cleaning products it suggests. While the hull and deck will get most of the attention, stowage lockers should be cleaned, to eliminate any odors. Pay special attention to areas where grime can hide, such as window tracks and under railings. 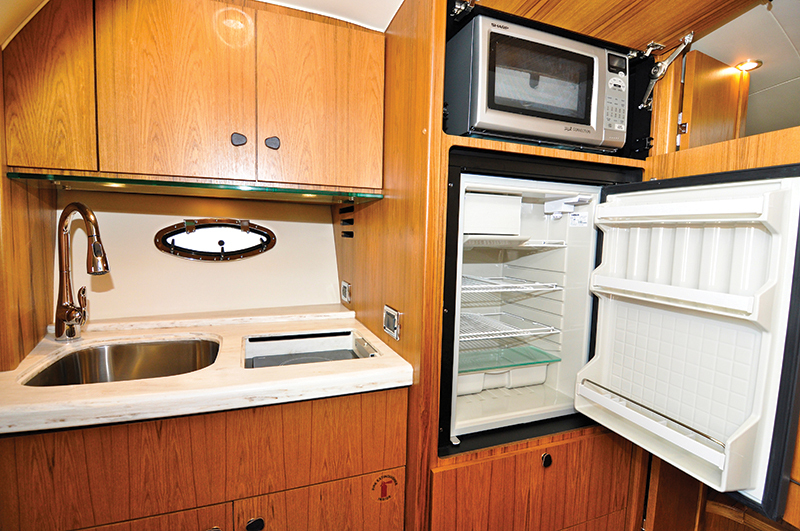 The living quarters and the galley should be well cleaned to remove musty odors coming from lockers or the head compartment. Holding tanks should be flushed too. If detailing doesn’t sound appealing but you have some mechanical skills, review the surveyor’s list for easy projects, such as replacing broken gauges or rubberized rocker switches that have seen better days. Parts are usually readily available online and involve simple connections. Most sellers won’t like this piece of advice, but the truth can hurt: A powerboat should be hauled out of the water and inspected long before the final surveyor inspection to close the sale. Knowing what’s below the waterline will head off any deal-breaking surprises. Buyers don’t want to assume the cost of deferred maintenance, especially routine maintenance the previous owner should have handled. Murray estimates that half of the used boats he has been asked to check out had no maintenance logs. In those cases, he simply walks off the boat. When the boat is out of the water, brokers say owners should fix any blistering and do bottom paint if it has been more than 18 months since the last treatment. The boatyard should examine the underwater running gear and treat any corrosion. This type of maintenance won’t bring the seller more money but will lead to a faster sale, saving money on insurance, dockage and maintenance. Right now, large powerboats are taking about 290 days to sell, Means said. “The speed to sale is tremendously faster when somebody walks up to a boat, falls in love with it emotionally and then isn’t tripped up during the survey by finding all these hidden things underneath the hatch,” Means said. Owners trying to sell a powerboat with a broken engine or rudder shaft can pretty much forget about selling it until the boat is fixed. Distressed boats tend to bring out the bottom feeders. “Almost nobody wants a project boat,” Means said. There are few problem-free powerboats on the used market, especially if the boat has been operated regularly. As tempting as it might be to fix all of the problems before putting up the For Sale sign, sellers should listen to the advice of a good broker. Brokers generally agree that a major renovation of the cabin or cockpit should be left up to the buyer (perhaps giving the buyer some money back on the closing costs instead of renovating the interior oneself is the better path). The same goes for sun-faded or torn canvas covers. Sometimes the seller has to invest some money to get a buyer. Means’ firm was brokering a 42-foot Sea Ray that had been on the market for two years. They convinced the owner to redo the upholstery, replace the clear vinyl and the canvas. Keiser said sellers should fix any delamination to the deck rather than trying to pass it on to the buyer. If the surveyor discovers separation between the hull and inner grid liner, it’s time to walk away. “You don’t want to jeopardize your life with the boat,” Keiser said. Selling a used boat can be stressful, but doing one’s homework will help navigate the process. Patience goes a long way during a boat sale that can take up to a year (or longer). The market for used boats in the U.S. is the strongest it has been in years. Blame the great recession of 2008, which saw boat production slow to a crawl and caused some iconic boat builders go out of business. Nearly 250,000 fewer powerboats were built during the recession as compared to the prior four years, according to the National Marine Manufacturers Association. Finding powerboats built between 2009 and 2012 can be hard. That’s why brokers are turning back the clock to the early 2000s. “The prices have firmed up over the last couple of years and they have gone up a little bit, but they didn’t go up nearly as quickly as they came down in 2008, 2009 and 2010,” King said. Boats built by now-defunct manufacturers might take a little more time to sell because there is no longer factory support. But even those boats are moving. If you decide to put a boat up for sale, be committed and ready to sell. • Prequalify. Buyers need to be prequalified or provide bank statements showing enough capital. • Price and Deposit. Both sides must reach an agreed-upon price, and the buyer will have to provide a deposit before proceeding to a sea trial. • Sea Trial. A representative will take the potential buyer out for a sea trial and run all the systems on the boat. • Surveyor. 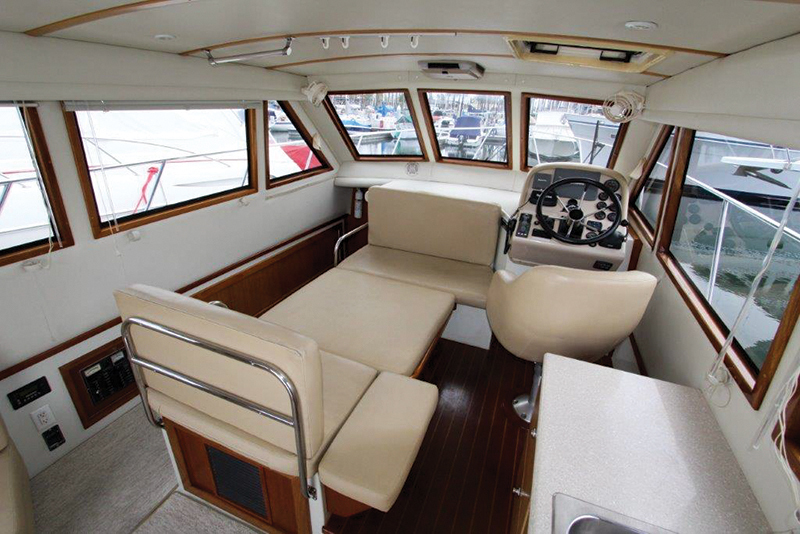 The buyer will hire a surveyor to do an inspection of the boat and provide a report. • Mechanical Inspection. A mechanic will check the entire mechanical system and take oil samples out of the generator, transmission and engines. The samples will be sent out for an analysis that looks for signs of wear. • Bottom Inspection. A full bottom survey will include an examination of the props, shafts and rudders. The inspector will look for extreme electrolysis and will sound the hull to look for dead spots. • Pay Day. When the sale closes, the seller will receive a check for the agreed-upon sale price minus the broker fees. Ask fellow boaters and employees at the local marina for recommendations. Meet with a few brokers and ask them to provide a list of boats they’ve sold in the past. Give special consideration to brokers who specialize in selling your brand. They may already have a buyer in the wings. Ask the broker to provide contact information for his past two sales and get those clients’ feedback. Brokers generally receive a 10 percent fee for the sale. Asking them to reduce the fee may cause them to be less motivated to work on your behalf. California and Florida allow for agreements up to six months, which can be renewed at the end of the term. Be leery of brokers who demand long-term contracts. Look for brokers who are members of the Yacht Brokers Association of America (YBAA). Many buyers and sellers prefer brokers who are Certified Professional Yacht Brokers (CPYB). 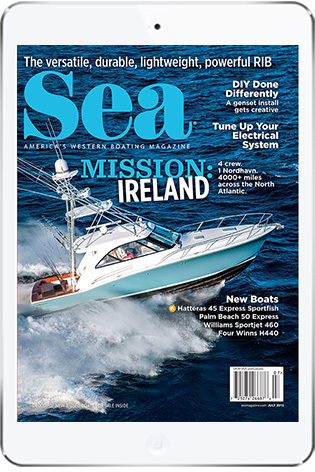 Ask the broker how he plans to market the boat online and in boating publications. The broker should handle the photo shoot and creating marketing materials. Brokers should update their clients at least once a month about potential prospects. Give a broker at least 60 days before evaluating his progress. Remember, a broker has sunk costs in photography and marketing. 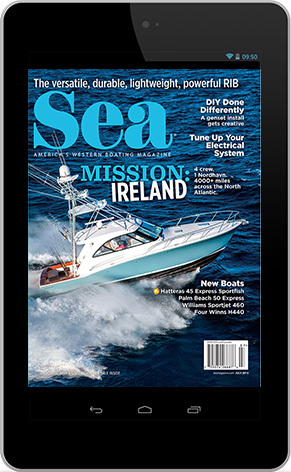 As a professional yacht broker for over 30 years, I find that this article espouses a significant amount of good advice to boat owners preparing to list their boats for sale. Because we do have a shortage of quality, late model brokerage boats on the West Coast, it becomes even more imperative that the older boats that we do have, be made as fresh and sellable as common sense and finances dictate. Many buyers will enter the market and then find themselves tumbling down a ladder of expectations: first they are attracted to a new boat – only to be stun-gunned by new boat prices; then they will decide to settle for a nearly-new, to enjoy the benefit of depreciation – and learn (as your article states) that in most cases there is no such thing; lastly, as they begin to realize that affordable, brokerage boats are much older than they ever thought they would consider buying – they are shown boats that are old, poorly maintained, haven’t been upgraded, and lack many of the new innovations that they see in magazines and at boat shows. Presenting a well maintained, upgraded, and ship-shape vessel will unquestionably make that savvy seller’s boat stand out. Lastly, the author neglects to mention one of the oldest and most respected broker associations in the world, the California Yacht Brokers Association (CYBA), as a West Coast source for professionalism and competence in the brokerage industry. California is one of just two states that requires broker licensing and bonding, and the ONLY state that requires rigorous testing for both brokers and salespersons. The CYBA works closing with the CA state Division of Boating and Waterways (DBW) to ensure that our brokers and salespersons are up to speed on regulations and requirements, and our Code of Ethics is the most comprehensive of any ethical practice standards in the brokerage world. Lastly, our CYBA purchase and listing forms are the most thorough, concise, and protective of buyers and sellers of any in the industry! What a glaring oversight to have been omitted from mention in this article!